I never tire of eating soups. Growing up I hated it them, but now they’re comfort food for me and remind me of my culture. Soups are a Colombian kitchen staple and each region has its own variations. 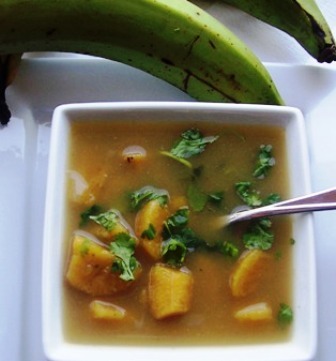 This Sopa de Plátano verde is a simple, but delicious traditional Colombian soup. Place the onion, garlic, scallions and water in a blender and blend for 30 seconds. Place the water mixture and beef bouillon in a medium pot and bring to a boil. Reduce the heat to medium and add the rest of the ingredients except the cilantro. Cover the pot and reduce the heat to medium low and cook for 30 minutes or until the plantains are tender. Take half of the soup and transfer to a blender and purée. Add the purée soup back to the pot, stir and cook for 20 more minutes. Divide the soup in bowls and sprinkle cilantro on top. Serve with avocado and aji. Very Very unique recipe! Never thought of making soup with plantains! I love soups too. 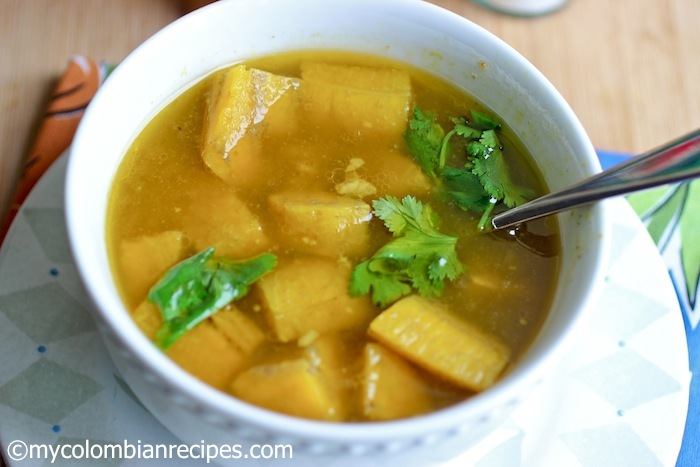 I’ve never had a plantain soup – it sounds really good and I would love to try it soon! hmmmm… i think i love the idea of this. 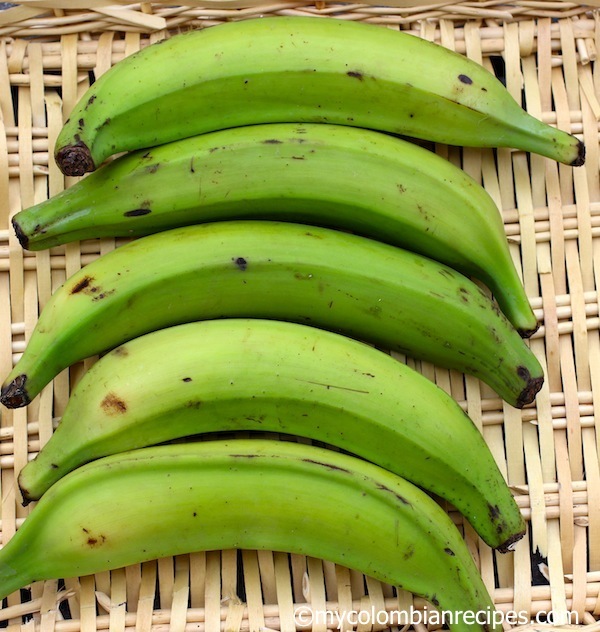 how soft does the plantain get after 30 minutes? really great way to add starch to the soup. i really love this idea. Great idea. I never thought of only platano soup. I only use them in sancocho.Gracias! I absolutely think this is the best soup in the world. 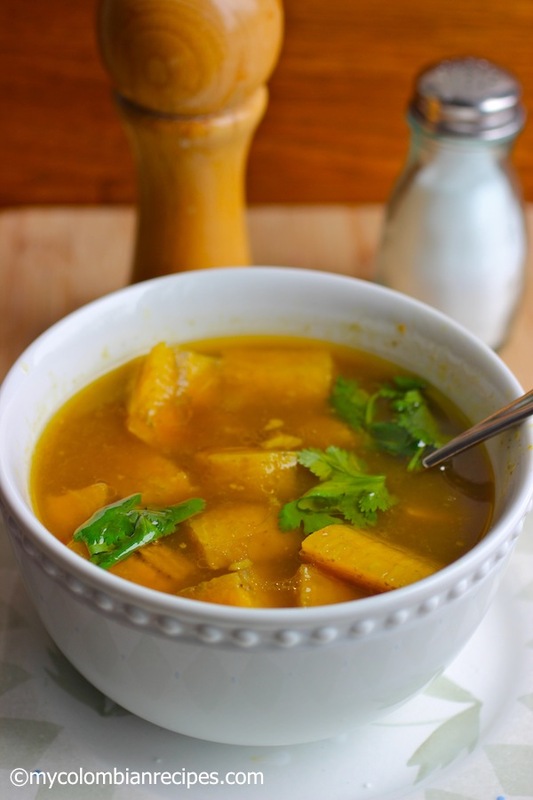 This plantain soup made with simple ingredients is so tasty, as well as, healthy for the soul. I have a sweet sad story to go with my comment. 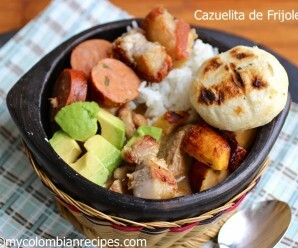 Five years ago, my mother died from leukemia and the food she liked best during her illness was Columbian food. In particular, she loved the plantain soup and the lentil soup made Columbian style. I am originally from Cuba and I had the pleasure to cook great home meals native of my country for my mother before she died, but from time to time she indulged on Columbian food and so did I. I have the most precious memories of the two of us sitting in my mom’s family room eating Columbian empanadas with the plantain soup. Mom, loved to add “tostones” to the soup which made it even better it was like eating foods for the gods. I am so grateful to a Columbian restaurant in Queens, NY named El Palacio de las Empanadas that’s where I would order my mom’s food the last six months of her life. I am happy to say, although a sad time to remember it was also a time filled with the most wonderful memories of sharing plantain soup with my dearest mom. I can still smell the aroma of cilantro and tostones in the soup and the best smile I ever saw on my mom’s face as she enjoyed a spoon at a time of this marvelous soup. Thank you Columbia and friends for giving me a little bit of your culture with such beautiful memories. Thank you very much for that comment!!! Sorry friends for misspelling Colombian and Colombia I was typing too fast. 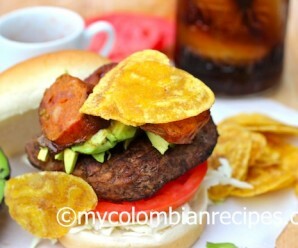 You are very welcome and please keep sharing delicious recipes from Colombia for more people need to be expose to your beautiful country, as well as culture. 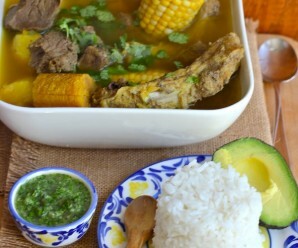 I made this soup this weekend and served it with white rice and avocado. It was so good. Thanks. I made this soup and it was comforting and delicious. Question regarding direction no. 4, “Take half of the soup and transfer to a blender and purée” does that include some of the plantains? This soup was great . I love Colombian food , so I am now trying to make it myself . Love your recipes and I’m going to try to make other things I have found here , thanks again . hello Erica – just wondering if it’s possible to make this soup in a crockpot? If so, what time and on high or low? Thanks! 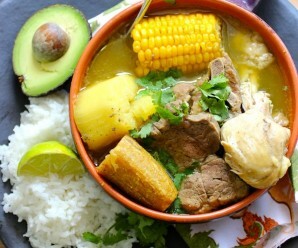 I’m Colombian and this soup looks AMAZING!! Hi Lilian, I didn’t try the recipe in the slow cooker, but I will try it soon and will let you know.